Dr. Ayyanar joined the Cure 4 the Kids Foundation, in 2015. Dr. Ayyanar is a fellowship trained Pediatric Neuro-Oncologist with expertise in the management of children and young adults affected by brain and spinal cord tumors. 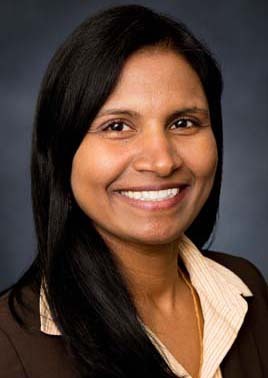 Dr. Ayyanar was most recently Director of Pediatric Neuro-Oncology at the University of Louisville in Kentucky. She is the only full-time physician based in Nevada who is trained in Pediatric Neuro-Oncology. Her research interests include high-grade brain tumors. Dr. Ayyanar completed her Pediatric residency at St. Joseph’s Children’s Hospital in Paterson, New Jersey. She completed her fellowship in Pediatric Hematology Oncology at Children’s Hospital at Montefiore, Albert Einstein College of Medicine, New York following which she completed an additional fellowship in Pediatric Neuro-Oncology at Boston Children’s Hospital/Harvard Medical School. Dr. Ayyanar is a member of the Children’s Oncology Group and a member of various professional organizations including American Society of Pediatric Hematology/Oncology and Society of Neuro-oncology. Dr. Ayyanar was born and raised in India and received her medical degree from the Madurai Medical College, Dr. M.G.R. Medical University.